We're right in the middle of those weird few days between Christmas and New Year. It's not a public holiday, but half the country seems to have shut up shop. There is an air of not-working everywhere. I have work to do. I need to write an overview of my thesis - a paragraph for each chapter which succinctly states what I will be arguing. It's a short enough document, but tricky in its brevity. Pottering about while the overview mulls through the back of my mind seems to be the way to go. This sort of work is an iterative process which requires a lot of mental distance, so it's nice to have some relatively quiet time to space my thoughts out. Over the last few days I've entertained myself filling in YouGov surveys, (re)reading Phillip Pullman novels and watching bad kid's movies (the latter two do sort of count as research for me). 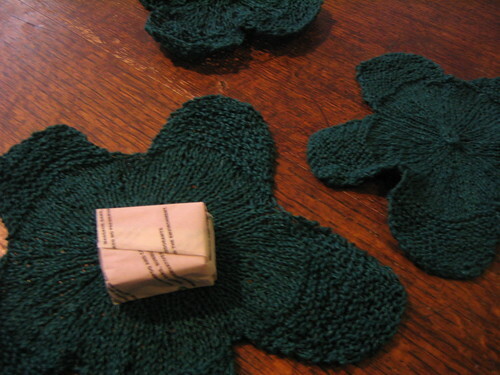 I gave my mother a sock-knitting lesson, did a pile of hand-washing, played with a pattern write-up, sewed some buttons, visited the winter sales, hoovered the hall and scrubbed the bath, every now and again returning to my thesis overview. Having spent the last couple of hours typing up my latest set of notes, I think a break to blog a so-far-secret Christmas FO is in order. Yarn: Euroflax Linen sportweight, leftover from my bottoms-up top. 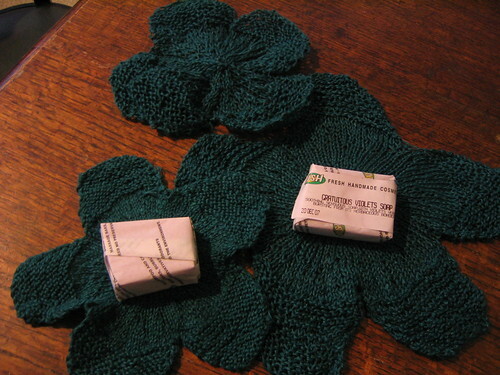 I managed three washcloths with a bit over half a ball. Needles: 2.5mm circular (smaller lily), 3.25mm (larger two). Notes: It's a reasonably quick project, though not as quick as you might think. I wasn't sure if I had enough yarn for a third, so I fudged the design slightly to make it smaller - it's very easily adaptable. 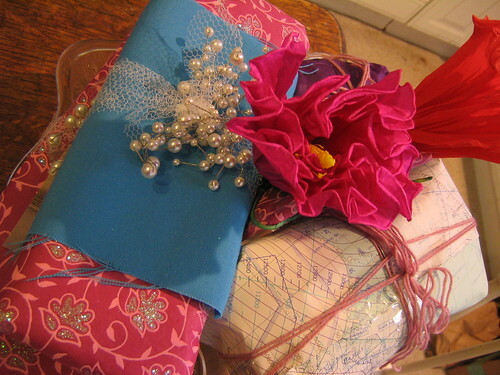 An excellent stash-buster and, finished-off with a tiny bar of violet-scented soap, made fantastic stocking-fillers. I know it's early, but yesterday was Christmas-with-friends, before we all end up having our Christmas-with-families. As it turned out, our pile was entirely fabric and yarny goodness. 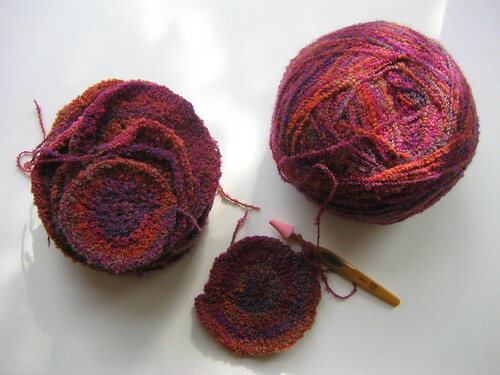 Plus, we manged to solve that ever-so-tricky question: what does one knit for a knitter? Turns out the simple answer is you make stuff they won't knit themselves. Just because you have the skills doesn't mean you'll have the time or inclination. I said she could keep the wonderlands too. It being the season of giving and all (and it didn't look like I was going to get them back). I'd also been saving some Japanese cotton for her, covered in cartoons of little animals in various forms of peril (burning, drowning - they're cute but also somewhat disturbing). In fact, we both did pretty well for fabrics walking the macabre/ beautiful line - Kirsty's cousin brought us back some amazing Day of the Dead prints from LA. I have turned into a spiral-producing machine. I'm not saying what these are for (it's that time of year...). Simply that they are driving me ever-so-slightly looney. However, I have mastered the art of an adjustable-ring cast-on. 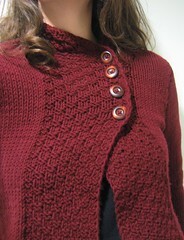 In boucle yarn. On a number 52 bus. Which is an achievement at least. And I'm nearly finished. 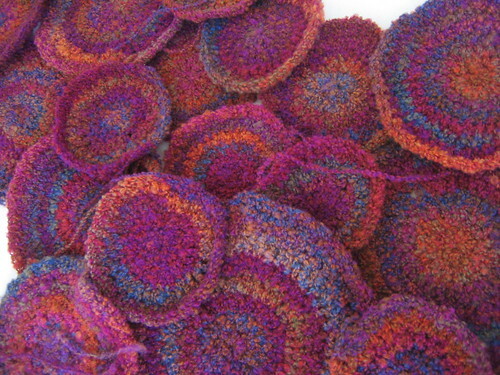 Maybe four more spirals to do, which equates to roughly two commutes back and forth to work. If I tell you my standard commute is up to 90 minutes each way, you'll see this is slo-oo-ow work. The yarn is from the Tokyo branch of Avril (aka Habu). And I have no idea what its called or what its made of because I don't read Japanese and long-ago lost the ball band. I suspect a synthetic mix with a bit of wool thrown in. There is 250g of the bleeding stuff though. I keep trying to get a decent photo of this. And I keep failing. Considering my previous bad luck with the jumper I think I should just blog on and be done with it. 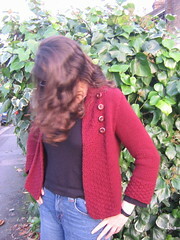 Pattern: The snappily titled "103-1 Jacket in Eskimo or Silke-Alpaca with A-shape and ¾-long or long sleeves", more commonly known as Drops Jacket. I added a slipped stitch at the start of each row - this gives a really nice neat edge. A Zimmerman trick, well worth applying. I also added a button because I felt it needed it. Needles: 5.0 mm 80cm circ. Yarn: Jaeger Extra Fine Merino Chunky very cheap from cucumberpatch.com sale page. 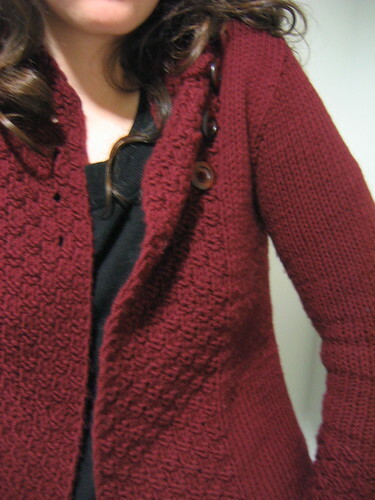 The pattern is written in two guages, but I fell in between the two, so worked as if it were aran but cast on for a slightly bigger size (I've noticed lots people who've knitted this jacket fudging this way). It's 100% wool - and even the extra fine merino itches my neck slightly, but as a cardigan I obviously have something underneath. I can't really wear it with short sleeves for long though - get ikky rash on my elbows. Grrr for wool allergy because I love this yarn - so squishy and warm. Buttons: Bought at John Lewis in a rush at a weekend, so I can't remember any details. 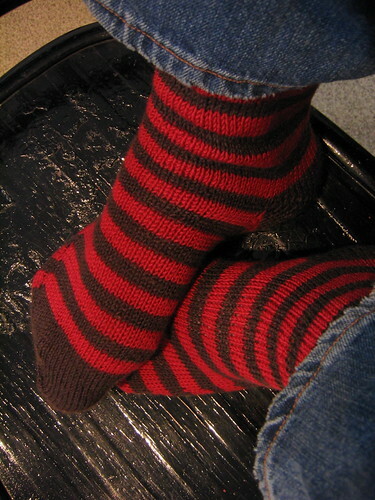 I really like the dark wood with the deep red yarn. Bad luck and photos aside, it's a great piece. 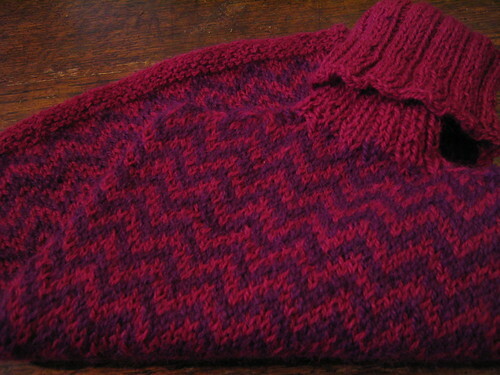 Warm, a quick knit, reasonably smart. And I promise it doesn't it doesn't normally cut my chest in quite such an unflattering manner when done up. Neither to I tend to hide behind my hair when wearing it. So much for winter photography.